Station building is in residential use, and the Grade II listed gate box is still functioning on the north platform; the south platform is partly demolished. Notes: Marston Moor station bears the name of the nearby battlefield where on 2 July 1644, during the Civil War, the English Parliamentarians led by Lord Fairfax and the Earl of Manchester, combined with the Scottish Covenanters under the Earl of Leven, defeated the Royalists who were commanded by Prince Rupert and the Marquess of Newcastle. Whilst the Parliamentarians and Covenanters lost some 300 men, 4,000 Royalists fell; such was the scale of their defeat that the Royalists ceased to exercise power in northern England. Now the battlefield is tranquil, lightly populated farmland. The railway between York and Harrogate is still open and thriving although it was on Beeching’s closure list. The western end of this route originated on 21 July 1845 when the Leeds & Thirsk Railway (L&T) was authorised to construct a branch from its planned main line at Starbeck (where it skirted the eastern fringe of Harrogate) to Knaresborough. The East & West Yorkshire Junction Railway (EWYJ) – described by Hoole (1974) as a protégé of George Hudson’s York & North Midland Railway (YNM) – was authorised on 16 July 1846 to build from York to Knaresborough. The L&T seemed to be showing excessive interest in the EWYJ in 1847, but Hudson’s influence won the day. At the opening the line from Skelton Junction, where the new route diverged from the Hudson’s York, Newcastle & Berwick Railway, the latter company provided the motive power. Note: the published timetable simply calls the western destination ‘Knaresborough’. As indicated in Reid’s Monthly Railway Time Table for May 1849 (above) trains from Marston (as the station was then known) travelled only as far west as Knaresborough – or, more correctly, to a point about a mile short of Knaresborough where there was a temporary terminus. From the opening of the line on 30 October 1848 a wooden shed at Hay Park Lane was as far as the trains could go. This temporary measure was necessary because the L&T’s viaduct over the River Nidd, immediately west of Knaresborough station, collapsed on 11 March 1848 as it approached completion. The successfully completed structure was notable for its castellated piers intended to complement the ruins of the nearby castle. On 21 July 1851 the Leeds Northern Railway (renamed from L&T on 3 July) branch from Starbeck opened to meet the line from York in Knaresborough, and the temporary Hay Park Lane station was closed and dismantled. What is now Starbeck station was identified in Bradshaw by various names – including Harrogate, Harrogate & Knaresborough, High Harrogate and Harrogate High – until it settled down to be Starbeck in 1857. Trains on the Leeds and Wetherby lines used another Harrogate station (the terminus usually suffixed ‘Brunswick’ in modern literature to distinguish it from the present station which replaced it in 1862). On 1 August 1862, when the present Harrogate station opened, it became the western terminus of the line from York. Marston Moor station opened with the line in 1848. On the Ordnance Survey 1: 10,560 map of 1850 it is named ‘Marston and Monkston Station’, although ‘Monkston’ is understood never to have been an official part of the name; and, moreover, local villages were shown on the same map as Moor Monkton and Nun Monkton (not ‘Monkston’) as was the rectory a short distance north of the station. Reliable sources suggest that the station was known simply as Marston until 1 October 1896. ‘Moor’ was added to the name by the North Eastern Railway, possibly because of the historical significance of the battlefield, but more likely because the company policy was to change its station’s names if there was any likelihood of confusion with any other station on its own or other companies’ lines. There is little settlement in the area, but the station received a substantial and attractive building in the distinctive architectural style also used at the three neighbouring stations of Poppleton, Cattal and Allerton (later known as Hopperton) which opened with the line in 1848. The design is credited to Thomas Grainger of Edinburgh who was engineer of both this and the Leeds Northern route. On the northern (up) platform close to the level crossing, the lofty red-brick gabled house is flanked by lower two-storey wings. A stone canted bay window on the ground floor of the house faces the platform, in the style of G T Andrews’s structures, and a glazed wooden verandah, sheltering the platform, extended the full length of the building; this was probably an NER addition. Photographs indicate that by the 1950s the north-western part of the verandah had been dismantled. The broad main gable above the upper storey window has a hooded circular recess which was possibly intended for a clock. Stone quoins and architraves lend dignity to the building. A timber signal box – constructed by the NER in 1910 to replace an exposed frame - stands between the station building and the level crossing. On the facing south platform a small waiting shelter stood towards its eastern end. Immediately north of the station was the ‘Union Tavern’, a railway-owned hostelry. Local residents report that this watering hole was unofficially the destination of railwaymen taking locomotives on test runs from York: Marston Moor was a safe distance from York for them to slake their thirst! Goods facilities were located on both sides of the running lines, entered from the west. Behind the south platform a siding served the loading dock and coal depot. North of the running lines one short siding backed the York-bound platform with another a short distance to the west and a long headshunt. In 1913 the goods handled at the station, in addition to coal, were hay/clover and livestock. In the 1940s aero-engines and Red Tamworth pigs were somewhat specialised items regularly loaded in the goods yard. Notes: ‡ Approximate time; calls by request *Timetable heading refers to the station as ‘High Harrogate’ – presumably owing to inertia, as High Harrogate had been named Starbeck since 1857. In the timetable, above, for February 1863 the Harrogate terminus is the present-day station which had opened in 1862. Information on Marston Moor’s stationmasters is incomplete, but in April 1879 a Mr Robinson retired, to be replaced by H Hick, who had been stationmaster at Goldsborough. Mr J Riddell was in post from an unknown date until September 1903 when he was succeeded by William Body, previously goods clerk at Thirsk, who was stationmaster at Marston Moor until October 1914 when he was promoted to be stationmaster at the neighbouring Cattal. The 1896 table, below, shows the situation shortly before road motor transport began to offer competition to the trains. The Wednesday-only arrival at 3.46pm is for passengers to alight having visited Knaresborough market. NER statistics for 1911 reveal that only 984 people lived within the hinterland of the station and that 6,234 tickets were issued. In World War I the neighbouring Hessay station closed as an economy measure – only 3,292 tickets had been booked here in 1911 – but it had reopened fully by summer 1922; Marston Moor’s users were spared this inconvenience. The July 1920 timetable showed little change in the frequency of Marston Moor’s train service. From December 1914, when he left his post in charge of Temple Hirst station, near Selby, until September 1920 J Bousfield was stationmaster at Marston Moor. When he was promoted to the same post at Wolsingham in County Durham his replacement, in November 1920, was J Herbert who had been assistant stationmaster at York. In January 1923 at the ‘Grouping’ the NER became part of the London & North Eastern Railway. The LNER was keen to make its operations more economical, and from c1932 the neighbouring Hessay station ceased to have its own stationmaster, this responsibility being given to Mr J Herbert who had been in post at Marston Moor since 1920. For much of its length the main road between York and Knaresborough (now the A59) was within a mile of the railway, and after World War 1 road motor services began to offer competition to trains. The local villages, however, with the exception of Green Hammerton, were some distance from this road, and buses would need to make numerous diversions from it to serve them adequately; thus (with the exception of Wilstrop Siding) the wayside stations would survive into the 1950s or, in the cases of Poppleton, Hammerton and Cattal, remain open today. This is in contrast to the lines between Malton and Scarborough, and Malton and Gilling, where all the villages were strung along a parallel main road, and their stations closed in 1930-31. For most of its life the York-Harrogate line had no Sunday service, however the July 1938 Bradshaw shows Sunday trains, but none called at Marston Moor. Stationmaster Herbert remained in post until the middle years of World War 2, retiring in June 1943 – he died in June 1964. Mr Herbert was replaced by E A Temple in August 1943, and he was stationmaster of Marston Moor and Hessay until November 1946 when he was promoted to be in charge of Thorp Arch for Boston Spa station, near Wetherby. From February 1947 until June 1948 the post was filled by R J Shaw; he had previously been stationmaster at Naburn, between York and Selby, and when he left Marston Moor and Hessay he took charge of Castleton and Commondale stations, between Stockton and Whitby. When the station passed into British Railways(North Eastern Region) administration the Harrogate-York service consisted in summer 1948 of only six Monday-to-Friday trains, and seven on Saturday; in the opposite direction there were seven on Monday-to-Friday and eight on Saturday. Approximately half of the trains called at Marston Moor. During early British Railways years the stationmasters were J J Edmond from August 1948 (who transferred here from the neighbouring Hammerton station) then P Howarth from July 1950. This gentleman was previously in charge of Hickleton & Thurnscoe, a goods station on the old Hull & Barnsley Railway. He retired in June 1952, but two months earlier R Powell took the post, having previously been stationmaster at Pickburn & Brodsworth goods station near Doncaster. Mr Powell was the final stationmaster of Marston Moor and Hessay. As a result of declining traffic in 1952/53 the trains between York and Harrogate made fewer calls at the least important stations, including Marston Moor. In August 1958 diesel multiple units were introduced on the York-Harrogate service, but Marston Moor’s passengers had little opportunity to enjoy them. 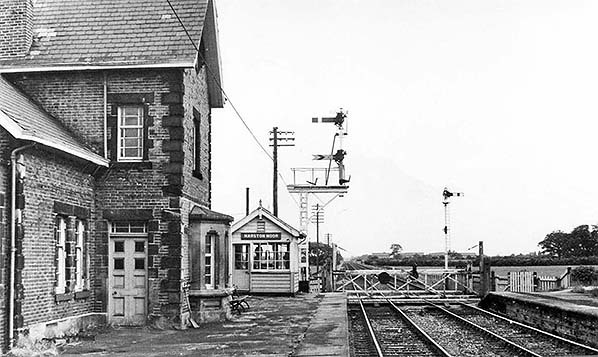 On 15 September 1958 many BR(NE) stations lost their passenger service, and this day was chosen to close four between York and Harrogate: Hessay, Marston Moor, Hopperton and Goldsborough. By this time Marston Moor’s service had declined to two Monday-to-Friday departures to York (three on Saturday) and three each weekday to Harrogate. 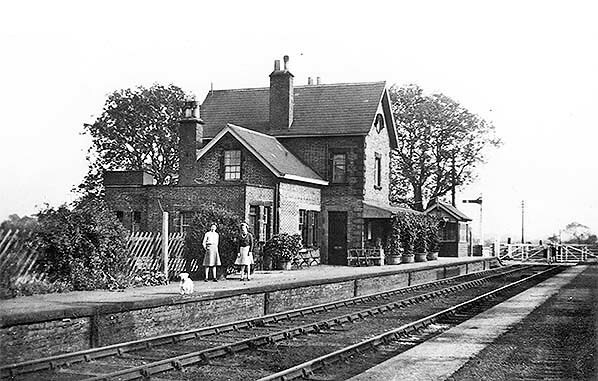 Poppleton, Cattal and Hammerton stations remained open to serve substantial villages. Marston Moor retained its goods service until it was discontinued by British Rail (NE) on 3 May 1965. However, one train per day continued to call at Marston Moor until at least 1967: this was ‘3B18’, the 0620 parcels working from York which stopped at Marston Moor at 06.36 to drop off mailbags for a waiting GPO van. There was no ‘balancing’ train call in the down direction. The other stations served by this train between York and Harrogate were open to passengers at this time. The call by the parcels train at Marston Moor perhaps explains why the down platform was retained here – but not why they also remained in place at Hessay and Goldsborough long after closure. In common with stationmasters elsewhere in north-east England those at Marston Moor had a lucrative side-line as local coal merchant. Mr R Powell, the last stationmaster, continued this business after the station closed. Despite their closure, Marston Moor station and the other 1958 casualties remained in a remarkable state of preservation, some displaying nameboards well into the 1960s in defiance of BR policy to remove them on closure. The up platform at Marston Moor remained in place, with one of the concrete stanchions which held the running-in nameboard still surviving. Demolition of the down platform was, reportedly, left unfinished because it was so solidly constructed. As noted earlier the York-Harrogate route was recommended for closure by Beeching in 1963. For much of its length the railway runs parallel and close to the A59 road, and the only significant population centre served is Knaresborough, with fewer than 10,000 inhabitants in 1961. On 23 September 1964 official notice was given of the intention to close the line, but on 15 September 1966 Barbara Castle, Minister of Transport, refused on the grounds of hardship that would be caused. Economies were exercised by introducing single-line working on 4 June 1972 between York and Hammerton (through Marston Moor) and between Cattal and Knaresborough on 16 December 1973. On the section through Marston Moor the down track had been removed by May 1973. 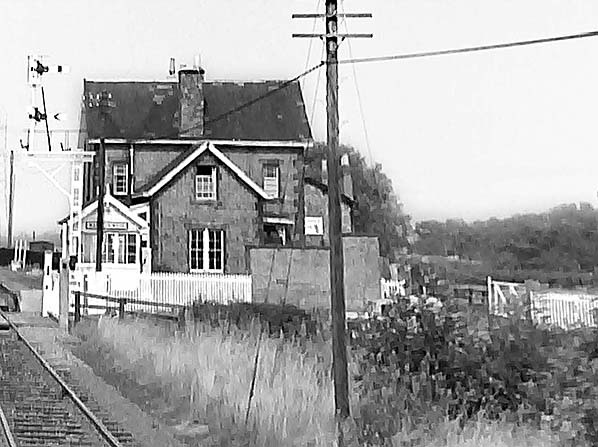 When single-line working began through Marston Moor the signal box was demoted to a gate box. On 3 March 1972, shortly before the singling took place, the Marston Moor relief signalman Ken Bristow played an important part in the incident of the runaway Class 31 diesel locomotive. For some reason the loco escaped, under power, from Harrogate goods yard, and aided by the largely downward gradients (1 in 66 for much of the way from Harrogate to Dragon Junction) it smashed through the gates at Starbeck station crossing – fortunately encountering no vehicles or pedestrians. The 4-5-5 ‘train running away in right direction’ bell-code was transmitted to the signal boxes on the way to York. When the locomotive reached Marston Moor, slowing down on the level stretch after its 14-mile adventure, the relief signalman jumped into the cab with a view to stopping it, but was unsure how to do this. With presence of mind he found and turned the handbrake wheel, which brought the runaway to a stop before Hessay station and crossing were reached. One of the curiosities of the York – Harrogate line is that in 2016 it remains a stronghold of semaphore signals and manually operated, attended level crossing gates, such as at Marston Moor. At Marston Moor the Grade II listed gate box is still in use on the extant north platform, adjacent to the station buildings. Its lever-frame is over a century old, being installed before the box was added in 1910, and suggestions have been made that it could date from as early as 1873. In addition to locking the gate, the box controls home and distant signals to protect the level crossing. The gates are opened and closed manually, as seen on one of the accompanying photographs. There are probably several factors at work to explain the survival of the attended crossings. At present there is no problem with availability of staff for these duties. The equipment installed when track-singling was carried out in the 1970s is still serviceable, and with restoration of double track and even electrification in prospect it would make little sense to automate the crossings and train control until it is clear how and when the route will be upgraded – which surely will happen soon. Once considered expendable, the York-Harrogate route has gone from strength to strength with an hourly weekday service operating to and from Leeds and stopping at all stations; a further hourly service runs between Knaresborough, Harrogate and Leeds, and there are also frequent Sunday trains. On a number of recent journeys between Harrogate and York the author has noted that the trains are well-used, sometimes with standing room only, even outside the rush hour. Organised holidays tours based in Harrogate but visiting York for the day provide many passengers for the line during the summer half of the year. Whatever the future holds for the York - Harrogate line, it is unlikely that any justification can be found for reopening Marston Moor station, and it is probably only a matter of time before control of the level crossing is automated. 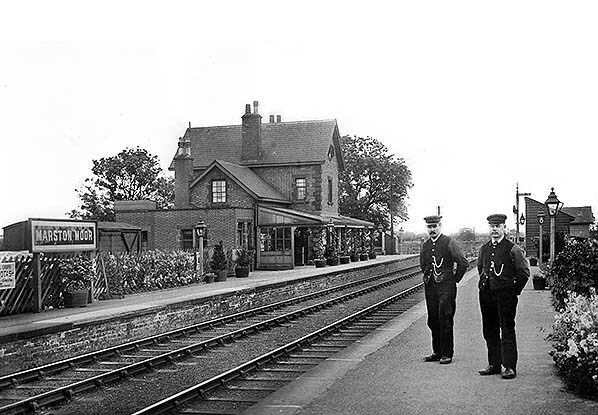 Marston Moor station, looking south-east from the down platform c1906. The main passenger building is on the up platform consisting the stationmaster’s house, offices and waiting and toilet facilities for passengers. The design of the substantial building is similar to those at Hopperton, Cattal and Poppleton. At this time a verandah stretches the full length of the building, and additional shelter is provided by the end-screens. The running-in nameboard is of standard North Eastern Railway design, with cream letters on a terra-cotta background; the timber fence behind the platform , the timber waiting shed with its steep pent roof and the lamp standards and cradles are also typically NER. The signals and crossing are controlled from a frame in the shelter at the far end of the platform; a formal signal box, seen on many of the later photographs, would be built in 1910. The station appears to be in immaculate condition, for which the station staff, in the foreground, can be justly proud. If any reader can confirm the identity of either of these men, please let us know. 1850 1: 10,560 OS map. The station is named ‘Marston and Monkston’ on this map which was published only two years after the line and station opened. ‘Monkston’ is understood never to have been an official part of the name; and, moreover, local villages are shown on this map as Moor Monkton and Nun Monkton (not ‘Monkston’) as is the rectory a short distance north of the station. The station building is shown on the up (north) platform and a coal depot and siding on down side. The surrounding area is lightly populated, as it remains today. 1909 1:2,500 OS map. The station is now named Marston Moor; ‘Moor’ would be added to the name in 1896. The outline of station building on the up platform, incorporating the stationmaster’s house, offices, waiting and toilet facilities, is shown with some precision; the signal box is marked between it and the level crossing. On the down platform the waiting shed, constructed by the NER, is shown opposite the main building. A siding serving the coal depot is behind the down platform. On the up side, west of the passenger station, are two goods sidings and a headshunt. There is no goods warehouse. A 1925 LNER plan of Marston Moor station. Click here for a larger version. 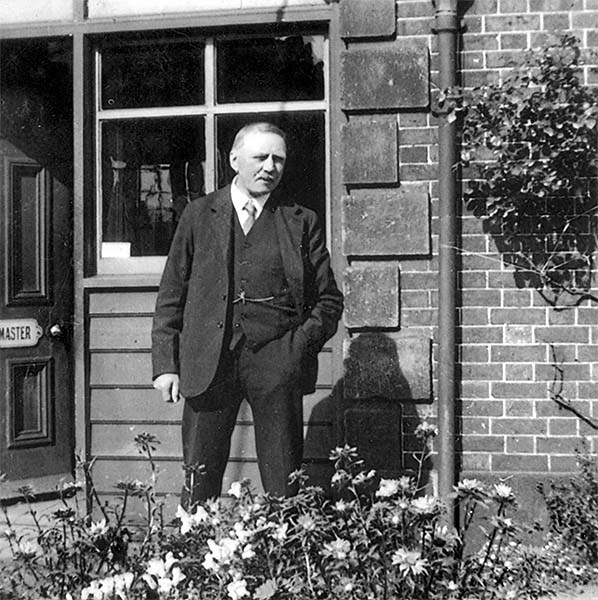 An undated photograph of a stationmaster at Marston Moor; if anyone knows his name, please let us know. The door-plate is of standard NER design. Country stations were often noted for their delightful gardens, and Marston Moor was no exception. The up platform at Marston Moor station c1948 looking north-east from the down platform. The brick-built structure incorporates the stationmaster’s house, offices and waiting and toilet facilities for passengers. The design of this handsome building is similar to those at Hopperton, Cattal and Poppleton; other stations, all open by 1850 at Goldsborough, Hammerton and Hessay, were provided with less impressive buildings which were originally gatekeepers’ houses. An awning (obscured by the luxuriant growth from the plant pots) is provided to shelter passengers; it originally continued into the recessed section at the near end of the building, and can be seen at its full extent on the photograph of c1906. The signal box is beyond the main building. The timber fence behind the platform is of a standard North Eastern Railway design, as is the austere lamp standard and cradle, lacking its oil lantern at the time of the photograph. The identities of the two women and the dog are unknown. Marston Moor, looking west on 17 May 1958. On the up platform the signal box and main station building are seen, accompanied by NER-style oil lanterns. There appears to be a wagon in the distant goods siding. On the down platform the only facility for passengers is the open-fronted timber waiting shed, of typical NER pent-roof design. Although the brake van at the down platform somewhat spoils the composition of this photograph much useful detail of the station, which was to close four months later, can still be enjoyed. 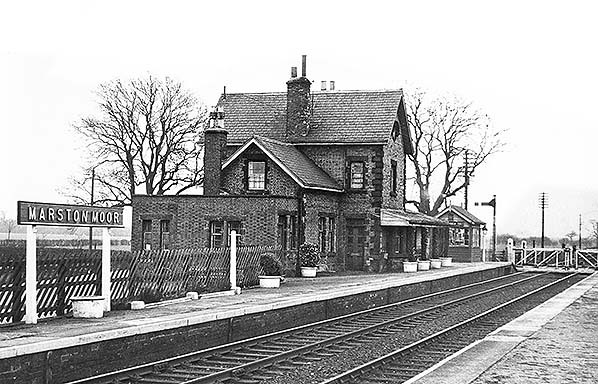 Marston Moor station on 19 March 1960. The station is immaculately presented, although it has been closed to passengers for 18 months; goods are still handled at this time. The up platform is seen here, looking north-east from the down platform. The brick-built structure incorporates the stationmaster’s house, offices and waiting and toilet facilities for passengers. An awning (obscured by the luxuriant growth from the plant pots) is provided to shelter passengers; it originally continued into the recessed section at the near end of the building, and can be seen at its full extent on the photograph of c1906. The signal box is beyond the main building. The timber fence behind the platform is of a standard North Eastern Railway design. The running-in nameboard, painted in BR(NE) tangerine, is a standard design used by the LNER in north-east England, notable for the metal letters pegged to a wooden board. 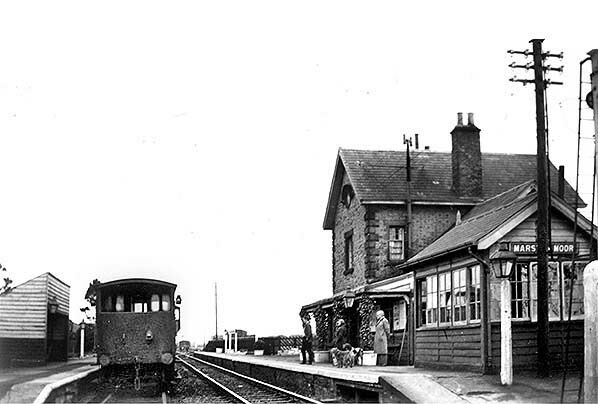 Looking south-east from the up platform of Marston Moor station after it closed to passengers (1958). The date of this photograph is uncertain, but is probably in the 1960s. The awning, seen in earlier views, has been removed from the front of the station building. The signal box nameplate is still painted in BR(NE) tangerine; it would later be re-painted in ‘Corporate Identity’ black and white. The bench is not of the ‘coiled serpent’ design most commonly associated with NER stations, but appears to be of the type whose iron legs were styled like knotted wood. The ramp of the down platform is visible, far right. Looking north-west towards Marston Moor station's up platform in August 1969. Despite being closed to passengers for 11 years the platform, station building and signal box are intact. The up track through the station would be taken out of use in 1972.